Marjoe Gortner, “Evangelism's answer to Mick Jagger,” as seen in the poster of the 1972 documentary Marjoe. Sarah Kernochan and Howard Smith's Oscar-winning film about Evangelical Christian scammers shows how religion, show business, and con artistry have a whole lot in common, as millions of people – whether due to despair, stupidity, and/or madness – are not only willing but eager to be deceived by the industrious snake-oil sales force of God, Inc. A former child preacher, Gortner went on to have a two-decade career in films and on television, including a key role in Mark Robson's 1974 all-star disaster blockbuster Earthquake. “Oscar's Docs: An Evening with Sarah Kernochan” will kick off the Academy of Motion Picture Arts and Sciences' 2007 “Monday Nights with Oscar” film series. Kernochan's two Academy Award-winning documentaries, Marjoe and Thoth, will be screened on Jan. 8, at 7 p.m., at the Academy Theater at Lighthouse International in New York City. 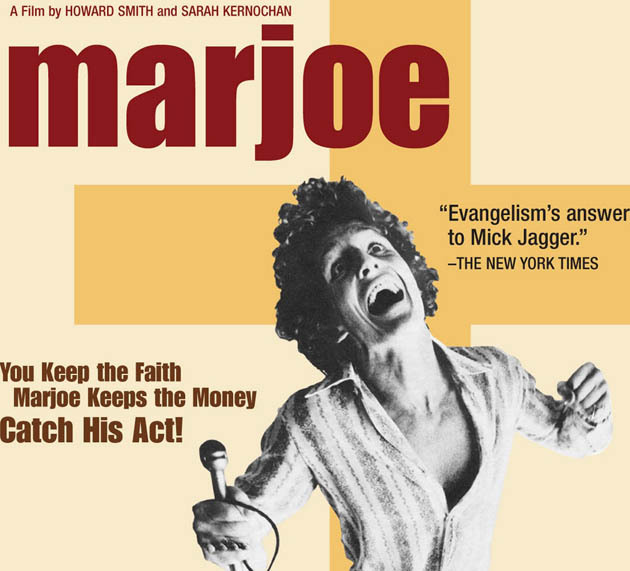 Winner of the 1972 Best Documentary Feature Oscar, Marjoe, co-directed by Sarah Kernochan and Howard Smith, revolves around Evangelical Christian preacher and con artist – and later film and television actor – Marjoe Gortner. Winner of the 2002 Best Documentary Short Oscar, Thoth focuses on “divinely inspired” performance artist S.K. Thoth. Hosted by historian and journalist Perry L. van der Meer, the Sarah Kernochan evening will include a post-screening chat with the filmmaker. That may help to explain why this exposé of fraudulent divine messengers was reportedly kept away from movie houses in the obsessively religious – and ungodly profitable – American South. In the mid-1970s he became a Hollywood actor, going on to appear in about 20 television productions – e..g, the series Fantasy Island and Falcon Crest; the movies The Marcus-Nelson Murders (Kojak pilot) and Mayday at 40,000 Feet! – in addition to low-budget, low-grade big-screen efforts such as Acapulco Gold, The Food of the Gods, Starcrash, Mausoleum, and Hellhole. Gortner's most important feature film role was in Mark Robson's 1974 all-star blockbuster Earthquake, in which he plays Los Angeles store manager/National Guard member Jody Joad, a tough guy with a thing for firearms and bodybuilders. Gortner's most recent big-screen role – as a preacher – was in Walter Hill's 1995 Western Wild Bill, starring Jeff Bridges, Ellen Barkin, John Hurt, Diane Lane, and Keith Carradine. The name Thoth refers to the ancient Egyptian deity, a master in divine law generally represented as either an ibis- or a baboon-headed man. Thoth was directed by Sarah Kernochan and produced by Kernochan and Lynn Appelle. “Monday Nights with Oscar” is a monthly series showcasing “high-quality prints” of Oscar-winning and/or -nominated movies. The Academy Theater at Lighthouse International is located at 111 East 59th Street in New York City. Tickets cost $5 for the general public and $3 for Academy members and students with a valid ID. For more information on the “Monday Nights with Oscar” film series, visit www.oscars.org. Charlton Heston. Ava Gardner. Geneviève Bujold. George Kennedy. Richard Roundtree. Lorne Greene. Victoria Principal. Barry Sullivan. Lloyd Nolan. Monica Lewis. Gabriel Dell. Lloyd Gough. John Randolph. Pedro Armendáriz Jr. Scott Hylands. Donald Moffat. Kip Niven. Walter Matthau (cameo, billed as Walter Matuschanskayasky). Marjoe poster featuring then Evangelical Christian preacher and con artist Marjoe Gortner: Cinema 5 Distributing. “Marjoe: Evangelical Christian Scammers Exposed in Oscar-Winning Doc” last updated in January 2019.